Sometimes it’s fun to show off your skills in a competition. Ordinarily around here, we don’t hold contests to determine who is the best at something, since we’d rather pay attention to the fun of what we’re doing than to keeping score. But we’re still building our skills along the way, improving our shot in archery and riflery, our rock climbing ability, and our weaving technique for example. 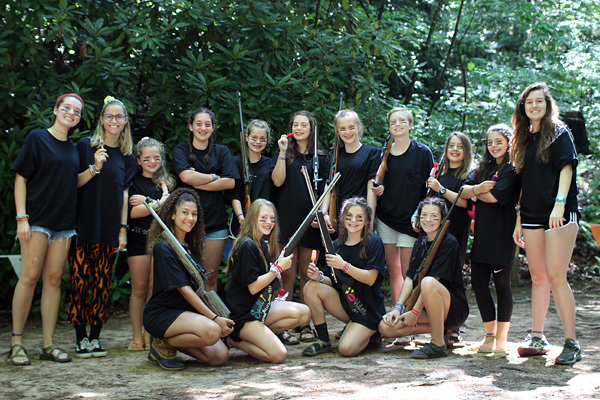 Tuesday, we got a little more serious because we invited the boys from Camp Carolina over for three friendly matches pitting our girls against their boys in tennis, archery and riflery. 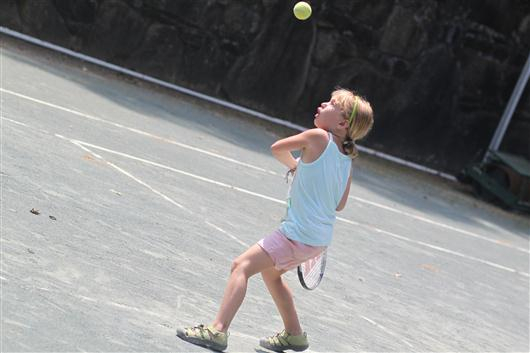 In recent years, our girls have traveled to Camp Carolina for these tournaments, so we were especially excited to host. To show it, the girls were ready with painted banners decorating the courts and shooting ranges, along with matching team outfits— custom t-shirts, all black for the riflery girls, white with big yellow tennis balls for the tennis team, and grey for the archers. The final tally gave the boys a slim margin of victory in both archery and riflery, while the girls ended up winning in tennis. If your daughter participated, I’m sure she’ll be proud of the outcome either way. After weeks of planning and preparation, Tuesday night the CAs (9th graders) unveiled their surprise banquet theme to the rest of the camp. Entitled “Another Night at the Museum,” the theme transformed the dining hall into an amazing collection of Art, Culture and Natural History museum displays. 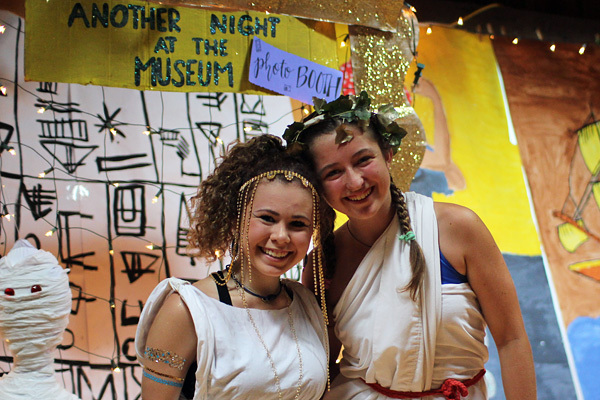 The CAs dressed as elements of these displays: Roman and Egyptian figures, a dinosaur, living paintings (e.g., A Girl with Pearl Earring), Albert Einstein, tourists who visit a museum, and the counselors as security guards. The campers arrived dressed in their red Rockbrook t-shirt and were thrilled to see all the painted posters lining every inch of wall space in the dining hall, and then amazed as the CAs performed a series of skits and dances where the Museum characters came to life and interacted with everyone. There was music and dancing, candy to enjoy, and a real celebratory feeling. It was an incredible fun evening for everyone. This afternoon the whole camp (and a few invited parents and guests) gathered in the gym to watch a performance of this session’s musical, “James and the Giant Peach.” Adapted from the children’s novel by Roald Dahl, this play tells the story of an orphan boy, James, who befriends several magical insects, and despite his cruel aunts, Spiker and Sponge, embarks on a journey to New York City inside a giant peach. Fantastic and offbeat, it was fun to see how much the girls enjoyed acting the parts and singing the songs of the show. During a brief intermission, the dance classes presented their end-of-session choreographed shows. The whole afternoon was really entertaining— a marvelous culmination and artistic celebration of the session. These girls have talent! Closing our session tonight was the ceremonial campfire we call “Spirit Fire.” This is another of the long traditions at Rockbrook. The campers and staff dress in their uniforms and gather around a great campfire set on the large rock (“Vesper Rock”) overlooking the camp lake for a program of traditional songs and personal reflections offered by counselors and campers from every age group. Tonight the fire looked gorgeous glowing orange amid the crowd of red and white uniforms, huddle closely. As the sun set and the woods around us grew bluer, then more grey before turning black, we could hear the waterfall splashing into the lake and the crickets chirping all around. In this beautiful setting we heard speeches recalling how Rockbrook has become important to these girls, the friendships formed, and the many ways we’ve all grown over these last few weeks. 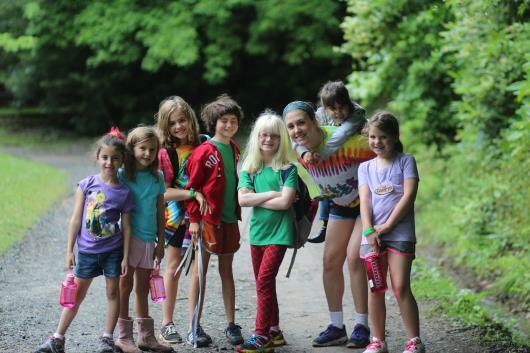 Sarah talked about the importance of finding moments during our busy lives to slow down and reconnect to those around us, like we do here at camp. She encouraged the girls to keep a journal throughout the year to record important experiences and to provide a quiet moment now and then for reflection. 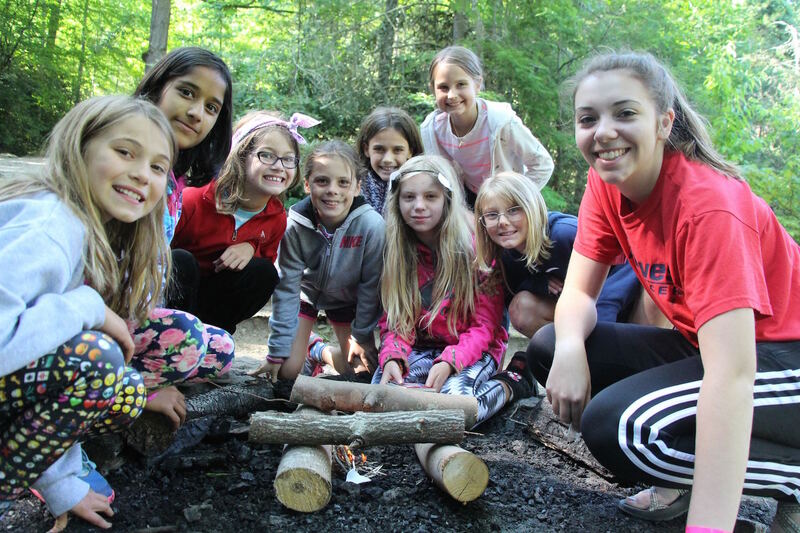 We hope time at Rockbrook has a lasting positive effect on the girls who attend and settle into the culture of this place. 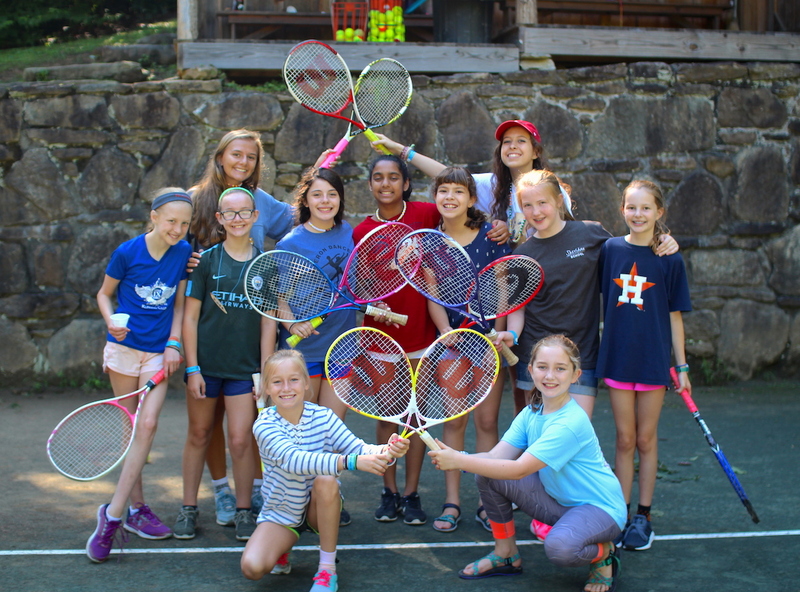 The feeling that comes from joining this kind of caring community can make a powerful difference in these girls’ lives, enlivening and recharging their deepest humanity, strengthening who they are long after camp. It’s been a pleasure this session to witness so many wonderful examples of this transformation. Thank you everyone for helping to make it possible. 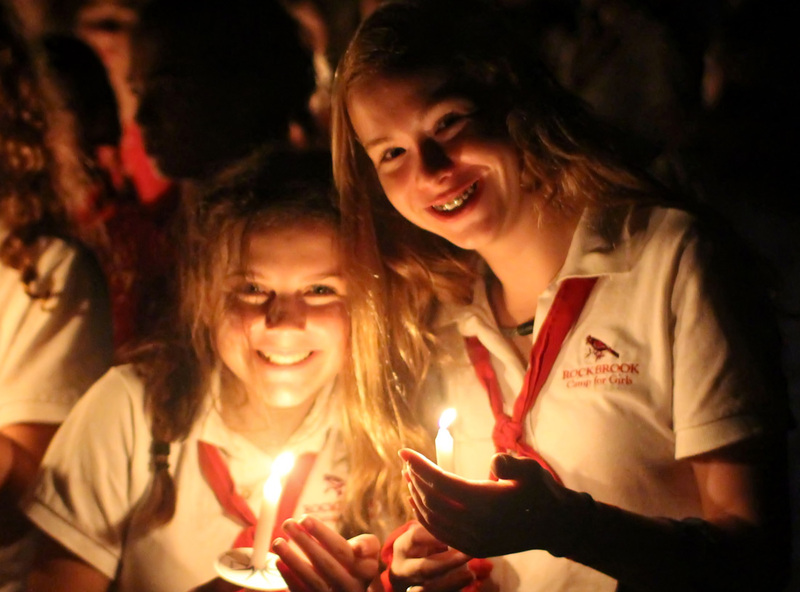 From the very moment we woke up this morning, girls have been savoring what they have been calling “the last normal day of camp.” With banquet tomorrow, and Spirit Fire on Wednesday, the end of first session seems to be rapidly approaching. Today feels normal, yet there is a certain urgency in the air to soak up the beauty and fun of camp before it comes to a close. 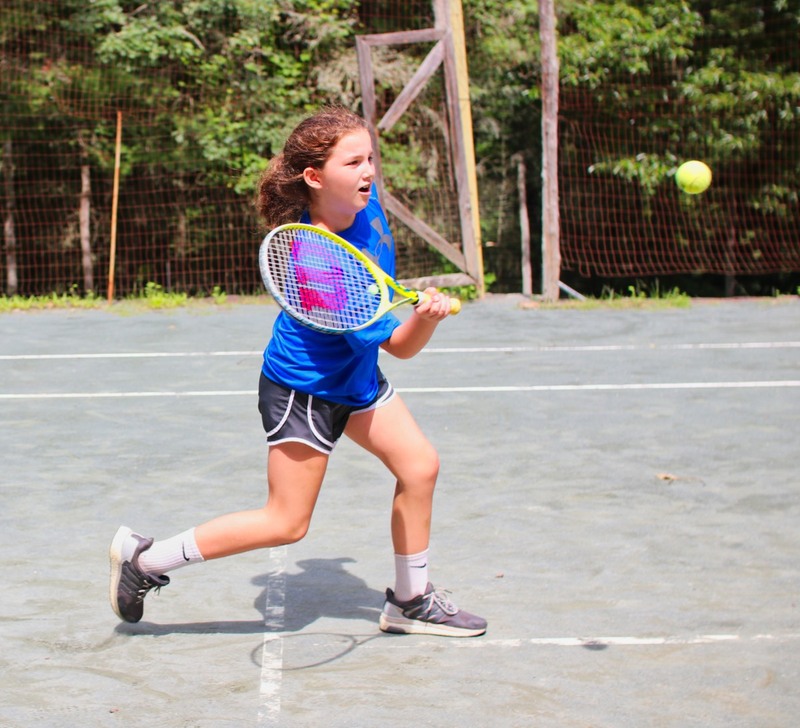 The campers are reenergized after a restful Sunday and intent on living it up throughout the day. You could see this attitude everywhere today. Many girls chose to go off camp on one of the many trips offered. Some girls went whitewater kayaking on the Upper Green River today, while others spent the day climbing at Cedar Rock. 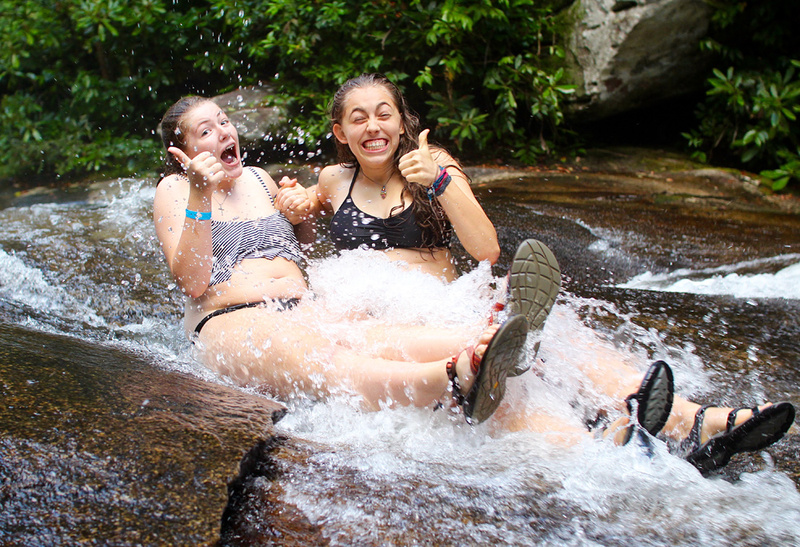 Brought back by high popularity, some middlers and seniors went on a “Wet and Wild” hike to Moore’s Cove, while other campers went to Dupont Forest to explore some of the best waterfalls in the area. 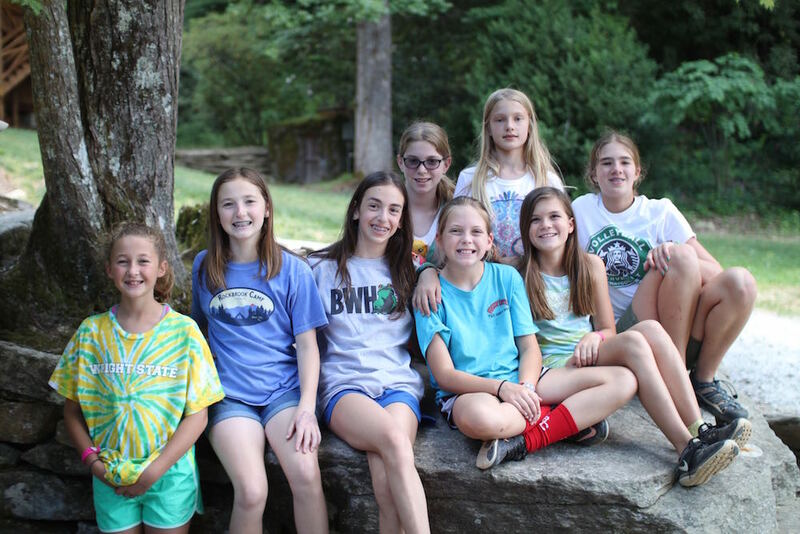 Going to camp in Western North Carolina offers so many avenues for adventures, and it is wonderful that there are so many options to engage with the outdoors every day—and so many girls who are excited to go on the trips! Many other girls stayed in camp and spent the day happily busy in their activities. In drama, the girls helped to paint the set for the upcoming play, The Lion King, and then spent time acting like some of the animals from the show. Girls love drama because they learn both hard skills such as set painting, auditioning techniques, and stage directions, but also soft skills like confidence, and feeling comfortable while acting silly in front of others. As I walked by the lake, I also came across the girls of curosty. In curosty, girls learn how to weave on looms and, on days like today, weave baskets. They sit with their toes in the creek on this beautiful day, chatting to each other while learning how to weave reeds and ultimately create a basket. This is a time-honored Rockbrook activity. 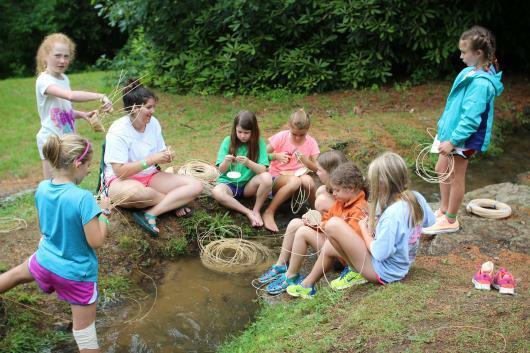 In fact, our camp mom, Laura, mentioned to me how much she loved that her kids spend time in the very same creek weaving baskets like the ones she used to make and like the ones her grandmother used to make. In addition to the activities, Rockbrook girls stayed busy during their free swims today! 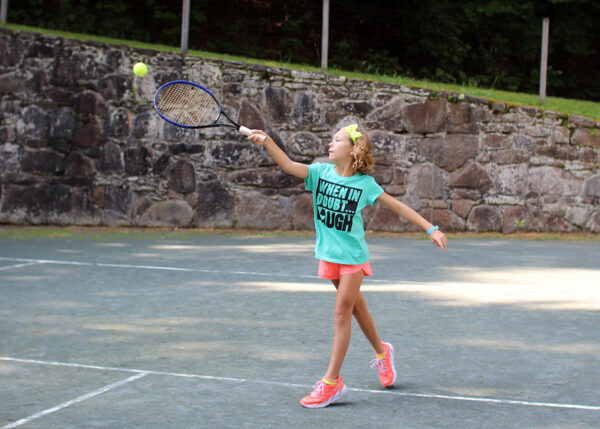 The counselor-camper tennis tournament was in full force first free swim. I had the opportunity to play with a camper, and we had so much fun. Through good communication, a few days of practice, and a lot of laughter, we advanced to the final round. Though we did not win the final match, we were proud of our friends who did! As the matches went on, I was struck by the genuine sportswomanship and large amounts of fun that were had on the court. We took it seriously– everyone wanted to do well–but the atmosphere was light and unwaveringly supportive. Many of those who were not playing tennis were seen swimming or running, both groups trying to complete their last requirements to go to Dolly’s. 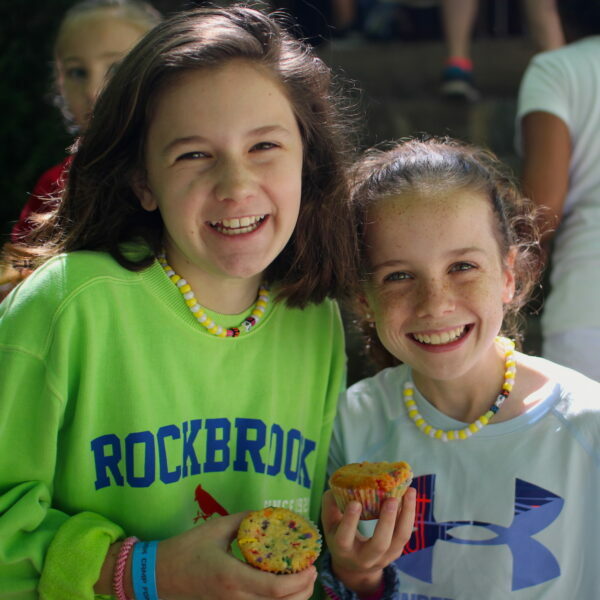 Rockbrook girls who complete a certain number of laps in the Rockbrook Lake become a part of the esteemed Mermaid Club. The whole camp sings a song in their honor! 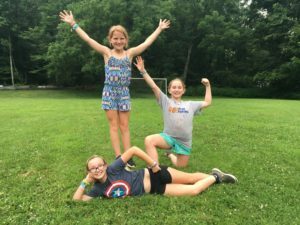 In the same vein, girls who participate in Rockbrook Runners and complete a certain number of miles (by walking or running), become a part of the Marathon Club. 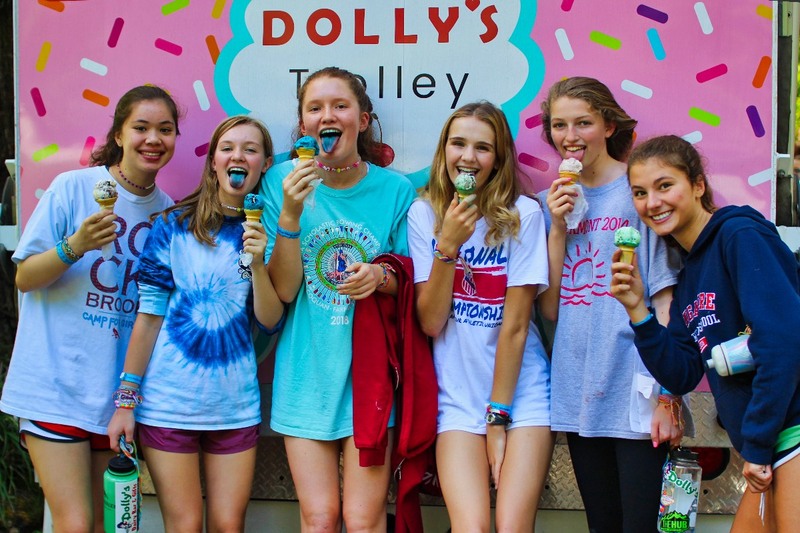 Both clubs are rewarded for their hard work and their many hours of free swims by going to Dolly’s ice cream. As we are approaching the end of camp, girls are buckling down and working hard toward achieving their goals. Girls ran and walked with Rockbrook Runners three different times today—first free swim, second free swim, and twilight! This means that girls who were especially motivated were able to run or walk six miles today! In the same way that we are savoring the activities we have to do, I have also seen girls savoring the friendships that they have made. 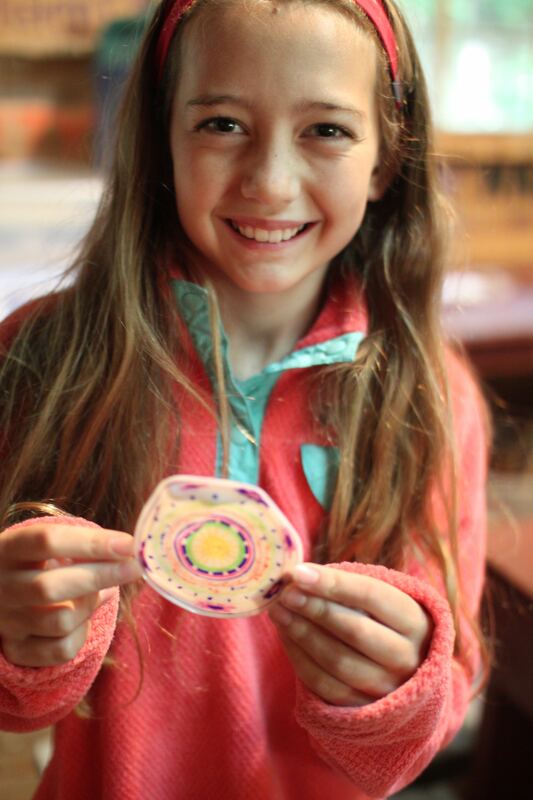 All day, I have seen girls busily finishing their friendship bracelets to give away to their friends, a piece of camp that travels with girls throughout the year. There has been much more intentionality to their togetherness: I have come across many clumps of girls just talking during free swims whereas they usually would write letters or read. As camp is ending, the girls’ focus has been on what has been the most important throughout their experience: the relationships they have formed with each other. As the day wound down, we all gathered in our lodges for the final night of evening program: counselor impersonations! The girls look forward to this throughout the session, a chance to poke good-natured fun at the counselors. We all laughed until our stomachs hurt and exchanged many hugs and sweet words before having our final goodnight circle as a line. We sang taps, passed the friendship squeeze, and said the Rockbrook Prayer before it was time for milk and cookies. During goodnight circle, we expect a certain amount of peace and comfort, but with it was extra special tonight, as we were not taking any part of the day for granted. As some girls got in to bed, the gentle rattle of the wagon could be heard going down the Senior Line as the CA girls started to set up for banquet and some girls headed to the hill to do a bit of stargazing before bed. So tomorrow, we will begin packing and for the next two days, we will celebrate our summers and say goodbye. But at Rockbrook, we have learned to live for today. And today was just a normal day at camp: a day well-lived. Watching the campers ride has been an especially fun treat recently. 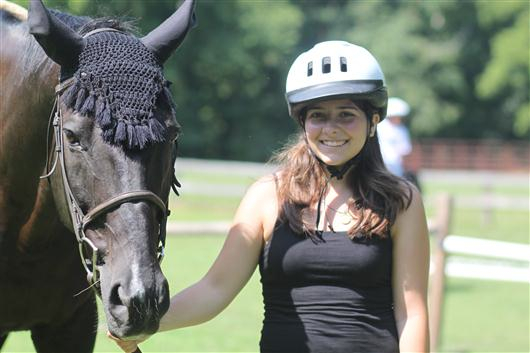 Dozens of girls have signed up for riding, some for their very first experience working with a horse, and others with more advanced skills. We have nine staff members devoted to teaching horseback riding at camp this summer, and with 30 horses in the RBC herd, there’s always a lot going on at the barn, from tacking up for a mounted lesson, to the farrier trimming the hooves on one of our Connemara ponies, to feeding and mucking out stalls. 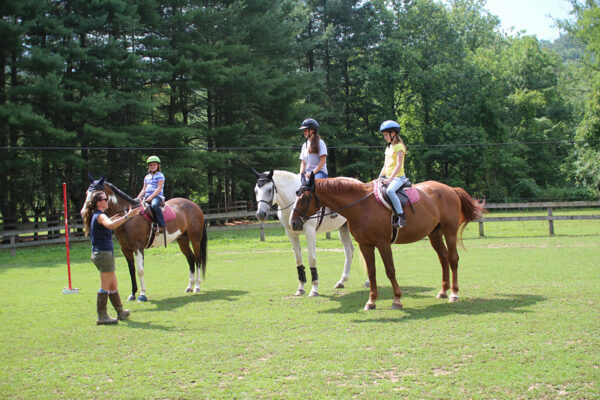 For the campers, there’s always something to learn too, both about the complexities of caring for the horses, and also about how to improve their riding skills. Today a beginner-level lesson in the upper ring had the girls doing a great job walking their mounts, steering them independently, while down in the lower (larger) ring, the advanced riders were working on jumping what looked like about 2 feet over rails. Both groups seemed happy and proud of their accomplishments. 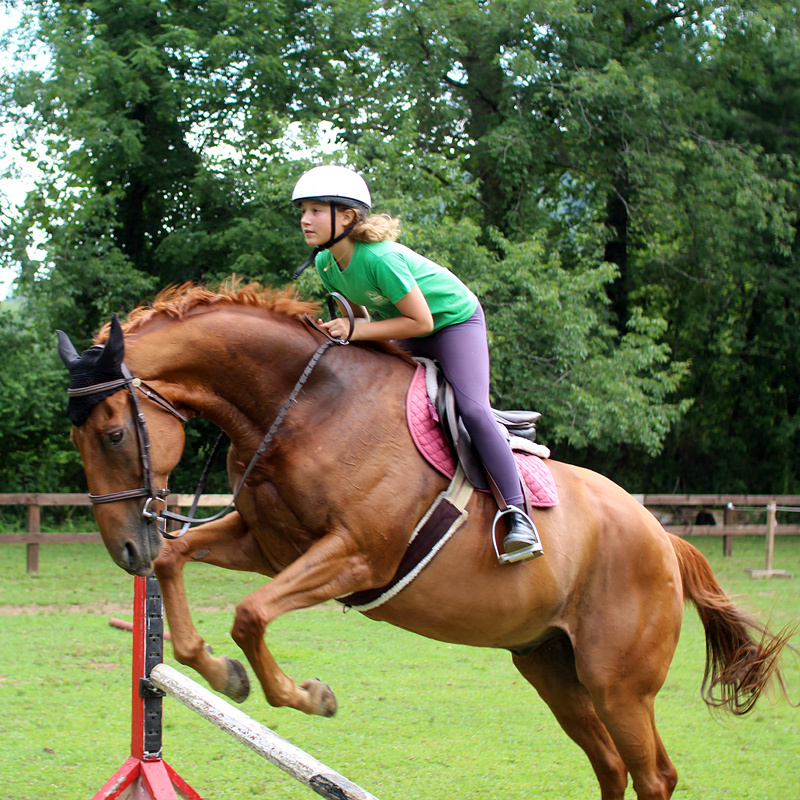 It’s always been a question why some girls are so keenly drawn to horses, as so many girls love riding here at Rockbrook. The Kitchen Sisters have just released an episode of their podcast “Fugitive Waves” that explores this phenomenon. It’s entitled “Horses, Unicorns and Dolphins.” In the 20-minute episode, we hear the voices of young girls, authors, research scientists, and lifelong riders describing why they ride, and how they feel in their relationships with these powerful animals. My favorite line from the program is when one rider describes horses as “power with a heart.” In a sense this summarizes it. Horseback riding is so meaningful, so magical, for girls because it includes a special relationship with that heart, an emotional collaboration with that power, and fundamentally, a unique form of friendship between two beings. For those open to this sort of relationship, there’s really nothing quite like horseback riding. 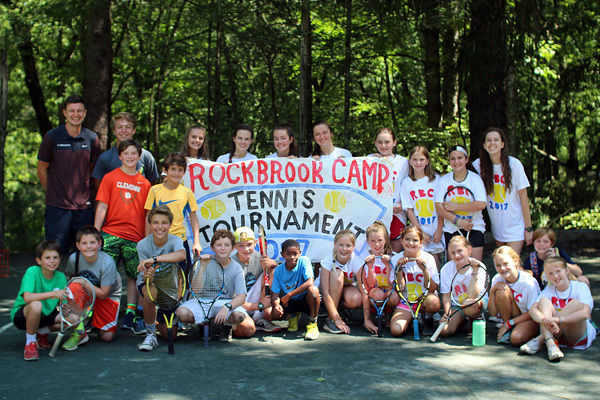 All of the other Rockbrook activities kept the campers busy throughout the morning activity periods. 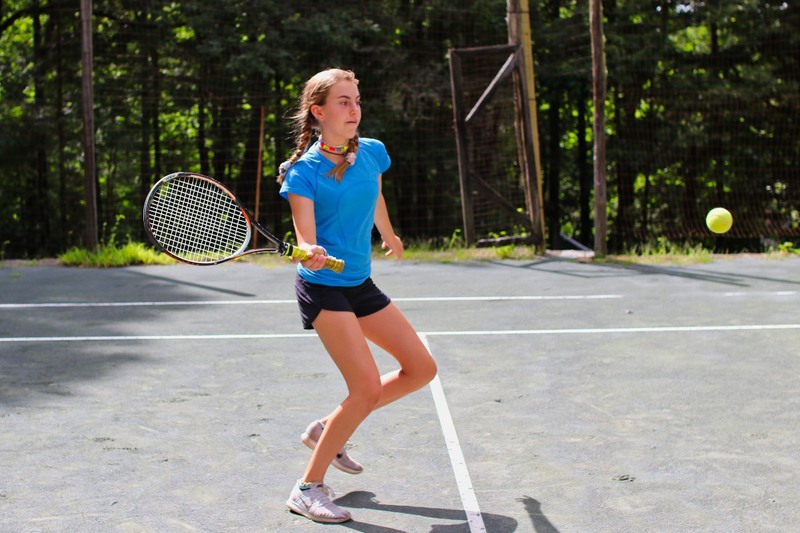 At tennis the girls worked on their volleys, while at archery and riflery, they steadied their aim. The girls climbed the Alpine Tower, and swam in the lake, if they weren’t stretching into yoga poses in the hillside lodge. Some made tie-dye t-shirts, and others sewed pillows. Some knitted hats, as other girls tied new bracelet patterns out of colorful embroidery floss. There was volleyball in the gym and cartwheels in the gymnastics area, as the WHOA instructors demonstrated how to build a fire. It’s astonishing how many different things the campers were doing at the same time all over camp! 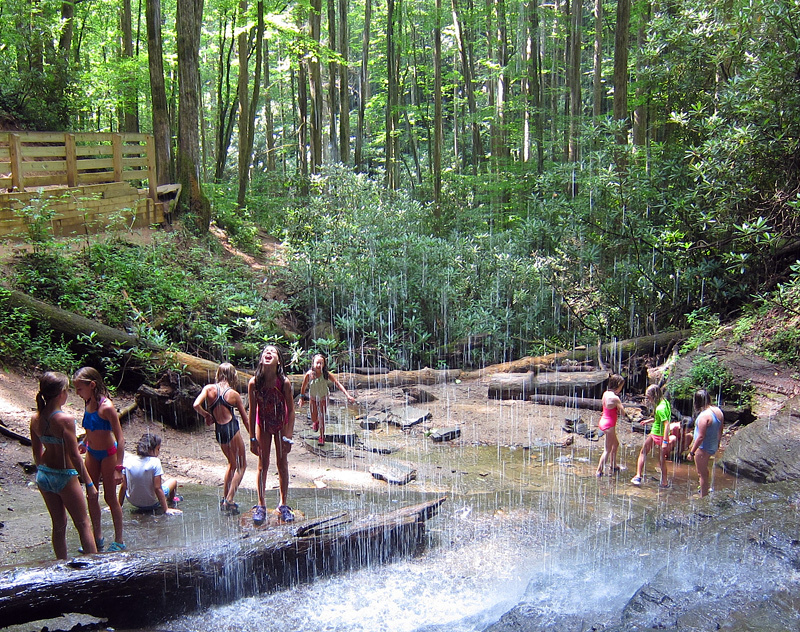 Also this morning, a group of Junior campers took a “swim” hike to Moore Cove in the Pisgah Forest. Dressed in their swimsuits with towels and water bottles stashed in day packs, they followed the gentle uphill trail into the cove. It’s a short walk that ends at an 80-foot tall waterfall. It’s been pretty dry lately, so the falling water was more like rain as it dripped over the rock high above. This made a perfect place to cool off in the warm sunshine, and the girls made great use use of the opportunity letting the water spray all over them. They played in the pool below and had a great time building cairns from stones they found… a real forest experience, real play, and definitely real fun. All of the Senior campers gathered later this afternoon for a picnic dinner in the Pisgah Forest, and a stop at Sliding Rock. Our picnic this time included a huge pile of watermelon, baked spaghetti the kitchen prepared for us in advance, salad, and sliced baguettes. I’d say it was far more of a complete meal than a “picnic.” One girl bragged to me that she ate 14 pieces of the bread! After eating, we enjoyed digesting our dinner a bit by running around playing a game of “I’m a Rockbrook Girl.” Akin to musical chairs, this game gets the the girls running from one place to another in a circle with each round identifying a new “Rockbrook Girl” for the center of the circle. There’s a lot of laughing and screaming, like all great outdoor games. 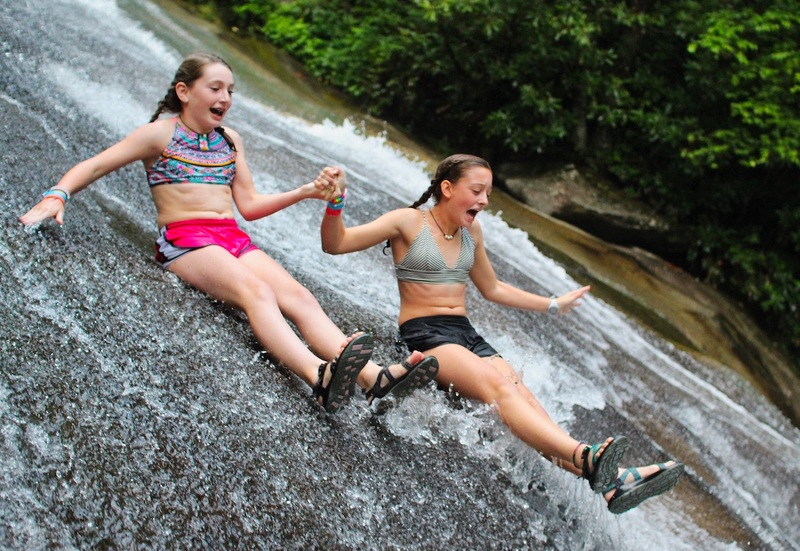 It was a short trip in the buses back to “the Rock,” and soon the girls were zipping down the natural water slide splashing into the deep pool at the bottom. It’s hard to describe how much the girls love sliding rock. As you slip, spin and roll through the “freezing” cold water, it’s only natural to scream your head off, and as you watch your friends, to laugh hysterically. It’s all great fun. “Rockbrook Chocolate Illusion” came next when we stopped at Dolly’s Dairy bar. 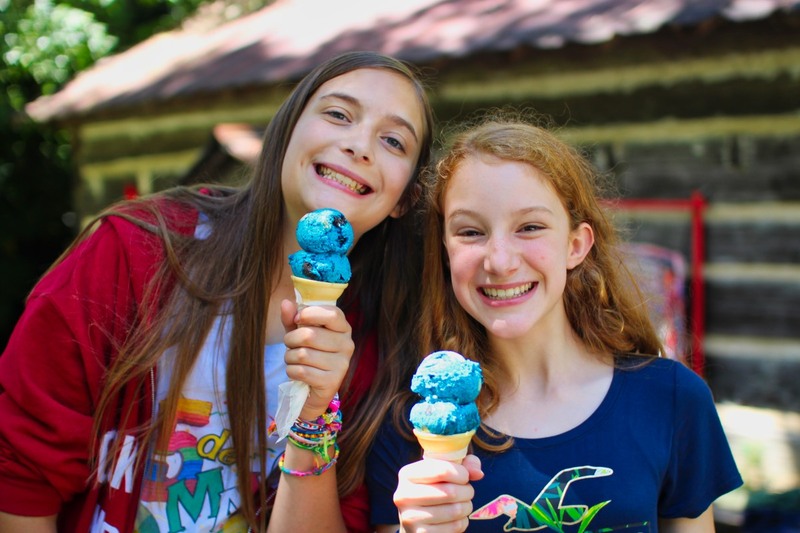 If not that flavor, then some other sweet treat topped off the outing when everyone ordered their favorite in a cup or cone. Eating the ice cream, even after all the chilly sliding, really heated everyone up and in no time we were singing songs, posing for more photos and simply enjoying the evening together. It was the perfect way to finish up an excellent trip out. Emily’s made another short video, this time focusing on some of the fun packed into a single afternoon at Rockbrook. Take a look! 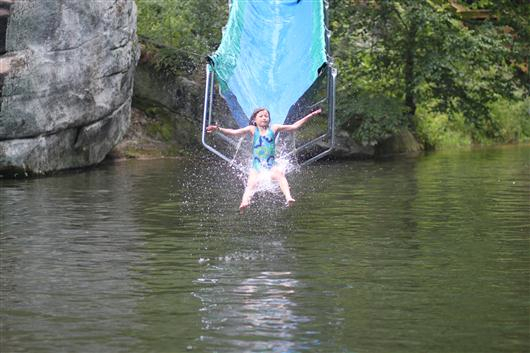 We could not have asked for a better day for fun down at the Rockbrook Lake. With temperatures in the 80’s and a beautiful sunny sky overhead, the lake was filled with activity. In our swimming classes we had loads of games going on such as “Categories”, where an instructor yells out a subject or question as you jump off the diving board and you have to reply before you hit the water. 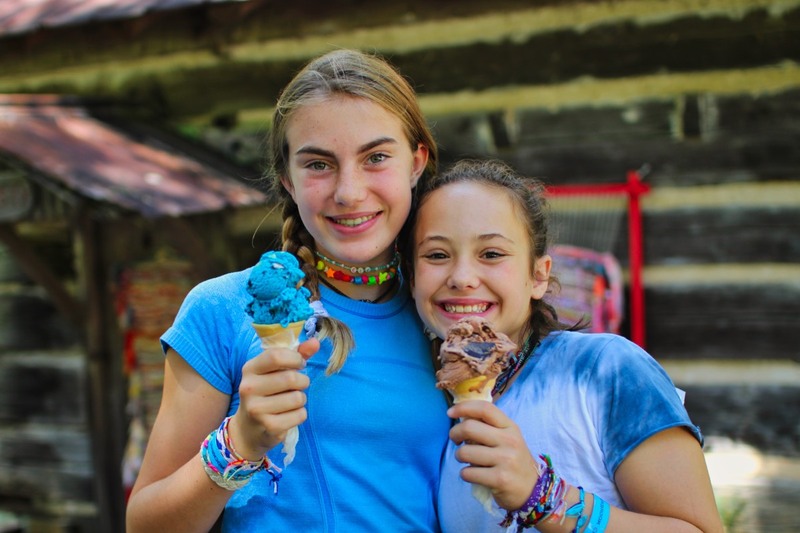 A commonly called out question is “what is your favorite camp muffin flavor?” or “name your favorite activity.” The girls have lots of laughs as the splash into the water while blurting out “chocolate chip”! 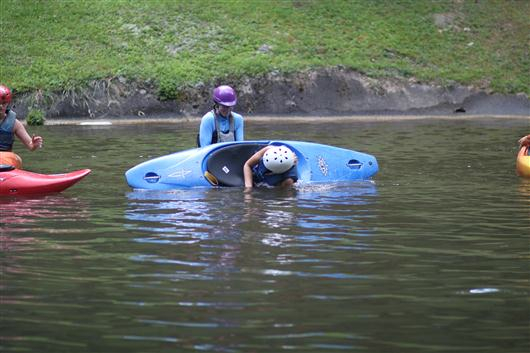 We also had a good time zipping on our water slide and over at canoeing and kayaking there was a roll clinic going on led by Leland and Andrea, our resident kayaking experts. It was quite a flurry of activity! The Rockbrook runners and walkers even took a moment to stroll by the lake after their exercise circuit and took a nice refreshing dip to cool off. The lake is often the center of camp life and today was no exception! Today, Resa, our sports director announced our session Tennis Tournament. Campers and staff of all skill levels can sign up to participate in the tournament. Resa sets up a ladder style tournament and the girls play during their free time or tennis class. All skill levels get to take part so it is quite a hit among the camp. We will announce the “Queen of the Court” for each age group at the end of the tournament. Along with the “Queen” award, we also have the “Best Attitude” award, the “Crazy Costume” award and the “Silly Smile” award. You can tell the tournament is not too serious but we all have a great time! Down at the Rockbrook Equestrian Center things were abuzz as the mini session campers had their first day of instruction. It is quite exciting to meet the herd of Rockbrook Horses (there are 30 horses to greet) that are great for girls of all skill levels. We have lots of beginner riders but we also have intermediate and advanced riders. From Nugget, our tiniest pony, to Gordon- the gentle giant- there is a horse for everyone! Another highlight of today was during our twilight time after dinner. 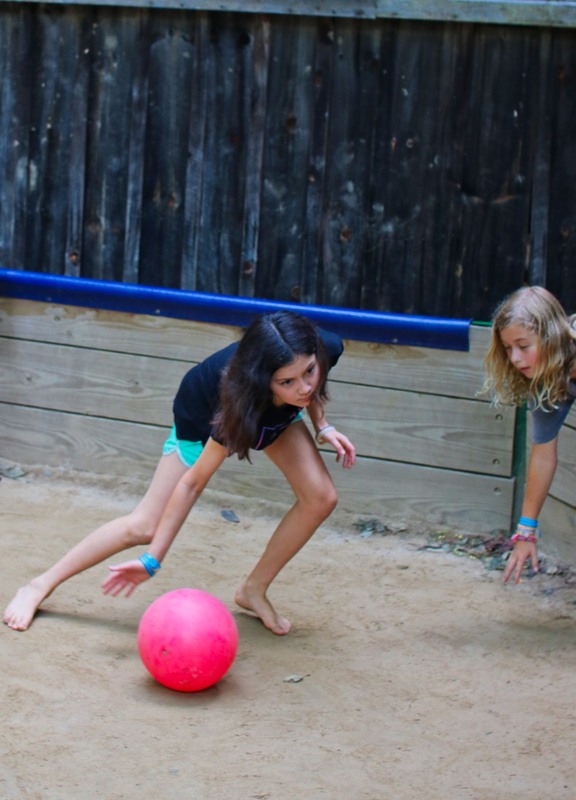 Each night different counselors offer special activities that the campers can choose to participate in. 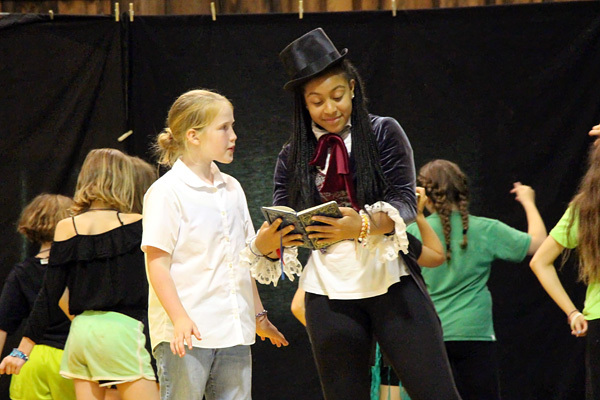 These activities are usually outside of the normal round of camp activities and are a great way to learn a new skill, wear a crazy costume or play some fun games. 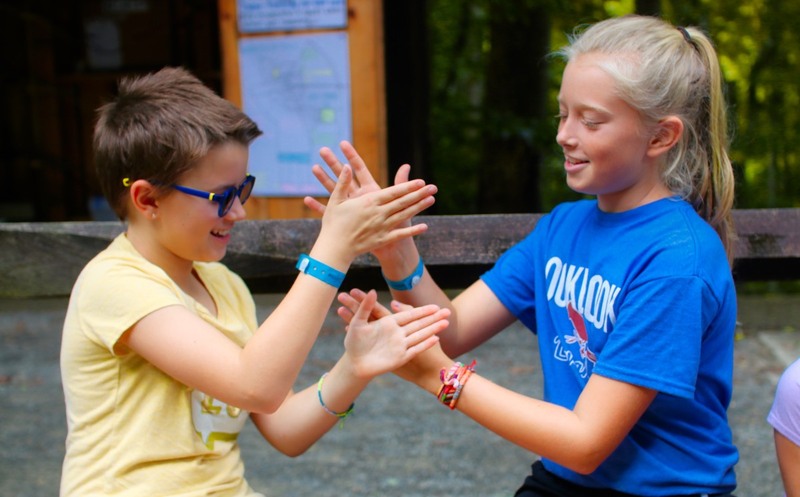 Twilights this summer have included Rockbrook Chorus, camp history and spirit night, capture the flag, creating fairy garden houses, working in the camp garden, camp calendar making, Castle Rock hikes or an all camp knockout game. Tonight’s twilights were really popular and very creative! One group offered homemade hula hoop making and another group offered a crazy costume walk. The hula hoops were made with a flexible pvc pipe and were decorated with all kinds of colored tape. It was quite a sight to see so many hula hoops in action! The costume walkers all donned their best crazy outfits and took a stroll around camp. It was almost like holiday caroling with all of the singing and silliness as they took their after dinner walk! Only at camp can such simple things make for such a special and memorable moment. These are great times to bond with a new friend and reflect on the highlights of another great day at camp! We’ve received another winter wonderland photo submission! Camper Anna Grace, an Atlanta resident, sent us a photo of her winterized hometown. 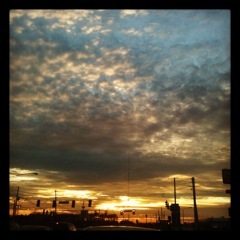 How beautiful are those clouds? That sunset is pretty spectacular too! This photo reminds us of Twilight time after dinner, when you can play games and hang out on the hill with your friends before Evening Program. What’s your favorite time of day at camp? Is it early in the morning, when the air is cool and you’ve got a day full of fun ahead? Or is it Free Swim, when you’re speeding down the water slide into the lake? Or maybe it’s whenever your favorite activity period is– Riflery? Pottery? Tennis? 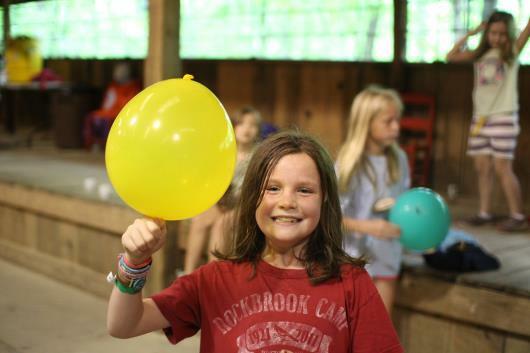 Whatever you choose to do on any given day at Rockbrook, you’re going to find yourself exploring new things, mastering new skills, and most importantly, having a ton of fun.